The best outdoor advertising in Davis can be found with Veale. We can help you secure one of the top billboards available in your area, allowing you to share your message with the thousands of people that pass by each day. When commuters see your message, you will grab their attention and inspire them to take action by supporting your business, event, or cause. Each month, your billboard will be viewed by a staggering number of people. Amongst the numerous options we have available, you can choose a traditional static billboard or a more modern and attention-grabbing digital billboard. Since the 1980s, Veale Outdoor Advertising has been helping local businesses secure the best billboards available. 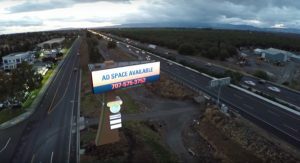 We are the experts when it comes to the best outdoor advertising in Davis. We have the leading edge on advertising in the local, regional, and national markets. Television, newspaper, and radio audiences are limited to their subscribers, viewers, readers, or listeners, but almost everyone who passes your billboard sign will see your message. Passers-by will quickly and concisely learn about your business, sale, or event. Amongst our top billboards are the digital billboards that allow you to continuously update your message as often as you need. If your business has weekly sales or events, you can modify your message each week to reflect current events. This is an advantage over static billboards that cannot be changed once they are hung. Contact the experts at Veale to learn more about the best outdoor advertising options available in Davis. We will work with you closely to understand your business, cause, or event’s specific message and needs. Give our billboard company a call today to learn more.